Firestorm 4.6.9: a Christmas feast of features and fixes! Update Thursday, December 11th: There will be a hotfix update for Firestorm, which will likely be made available on Friday, December 12th. This is to correct a couple of issues related to voice and RLV/a discovered with the 4.6.9.42969 release, and will likely add some additional fixes as well. I’ll have a further report available once the update is available. On Wednesday, December 10th, the Firestorm team announced the release Firestorm 4.6.9.42969. This is a hefty update which brings with it a lot of new functionality, together with bugs fixes and assorted improvements and updates. As always, the complete list of changes, together with all attributions, can be found in the release notes / change log, and I refer readers to that document for specifics on all contributors, FIRE JIRA links, etc. The following is intended as an overview of some of the more major / interesting changes, updates and fixes to be found in the release. Note that as a result of the Firestorm team’s policy to keep only 3 versions running, version 4.6.1 will be blocked, most likely early in the new year. The advice from the team is that If you are on 4.6.1, to please update now. Version 4.4.2 will continue to remain for Mac users until all the major Cocoa Mac bugs have been resolved. However, if you are not a Mac user, then there really isn’t any reason for you not to have updated, and the team again ask that you update as well. This release sees Firestorm remain on a parity with the Lab’s 3.7.8 code-base. However, a number of updates and fixes have been cherry-picked from upstream (such as the group ban functionality – see below), particularly bug fixes and stability improvements – please refer to the change log for details. 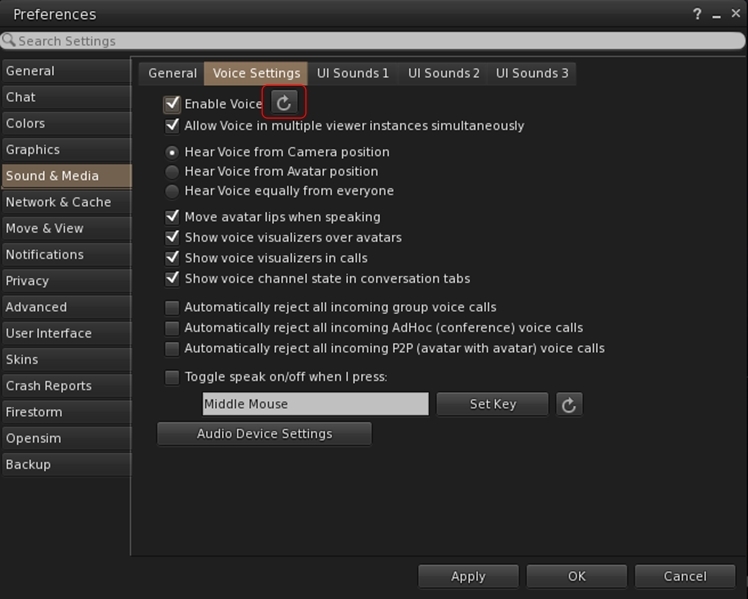 There are two new buttons located in close proximity to the Edit Linked check box. The build toolbar button should no longer be disabled when it shouldn’t be. Firestorm 4.6.9 brings with it a large number of features, updates and improvements to communications. These include, but are not limited to, the following. The viewer now automatically adds http:/ to the music URL in the parcel audio panel. To set an item of inventory to be sent with auto-response messages, drag and drop a suitable item from your inventory and into Preferences > Privacy > Autoresponse > Autoresponse Item. In addition, this release fixes getting an IM from yourself to yourself saying “Autoresponse sent” if somebody answers from an off-line IM via email. Also, having both “Autorespond to non friends” and “Only friends and group can call me or IM me” set no longer results in you getting two new IM sound alerts for every non-friend IM plus the non-friend receives your auto-response twice for each IM sent. The Contacts List floater has been revamped to match the look of the nearby chat and IM session floater, for a smoother and unique appearance. In addition, an option to pay someone directly from your Contacts List has been added to the right-click context menu (Comm > Contacts > Right click a name > Pay). 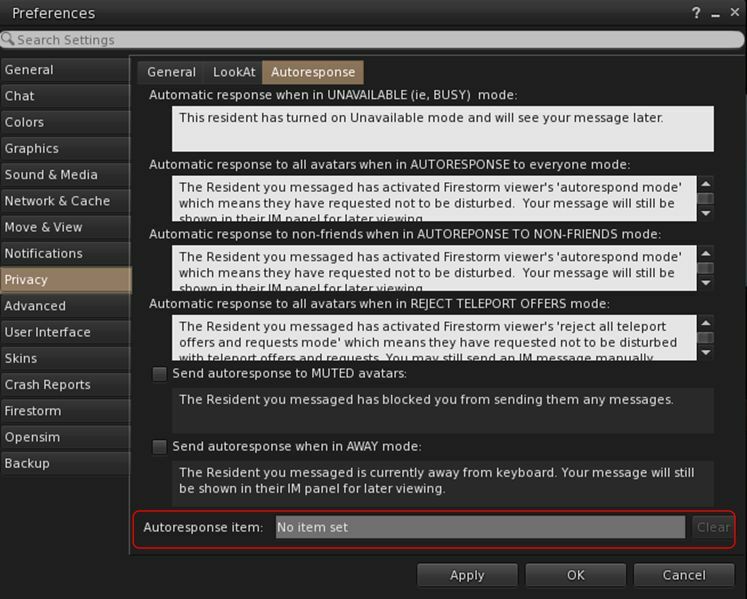 New to Firestorm 4.6.9 as well is the ability to choose which name columns should be displayed in the Contacts List. You can now choose between choose between user name, display name, full name, or a combination of these, and you can now display full names in your Contacts List as “Username (Display name)“. Finally, a option has also been added to hide the permissions columns (whether those in your Contacts List can see when you’re on-line, map you, etc.). All of these options can be found under Preferences > Firestorm > General. Multiple contacts can now be added to a Contact Set at once from the legacy Friends list. Region restart notices are now also displayed in nearby chat. Firestorm gains the group ban functionality with 4.6.9: so the capability first suggested by the Firestorm team comes to its spiritual home. For those unfamiliar with group bans, I have a complete overview available from the original release of the functionality by the Lab. However, and in brief: group bans allow the owners and officers of a group with open (or paid) enrolment to eject and ban those breaking the group’s operating rules or causing persistent trouble (e.g. by spamming group members) from the group. In addition, people can be pro-actively banned from a group. Up to 500 individual bans can be applied per group (after which, names must be removed from the ban list before new names can be added). 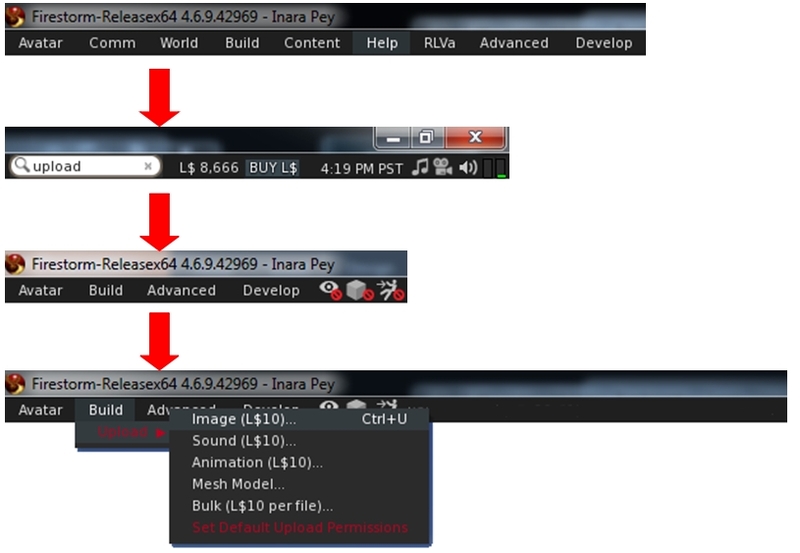 Group bans work in much the same way as parcel / estate bans, and are managed directly through the group panel within the viewer (CTRL-SHIFT-G). Again, please refer to my overview, linked-to above, for further information. 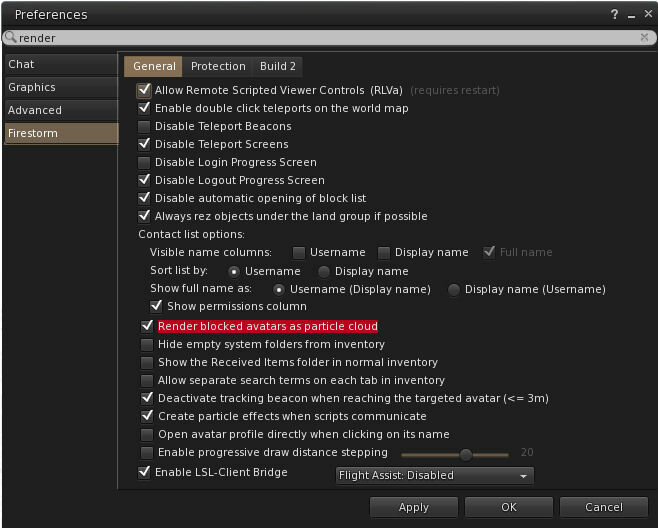 The Firestorm Animation Overrider gains a new option to delete broken links from the AO folder (Inventory > #Firestorm > Right click the #AO folder > Cleanup broken links). The Firestorm bridge no longer uses a special extra “bridge” attachment point and instead will attach to the Centre 2 HUD attachment point; there should be no difference in how the bridge behaves with this change. In addition, the Bridge object parameters are now set in the viewer code rather than LSL, which should reduce the cases of people being “rocked”. The Bridge version number has been bumped to force the bridge to recreate at login, and there have been a number of additional non-visible tweaks and updates to improve how the Bridge works. Firestorm’s inventory gets a handy replace inventory links feature. This allows broken inventory links to be “repaired”, should the UUID of the original item change (e.g. because you rez it in world to re-script it, or something). 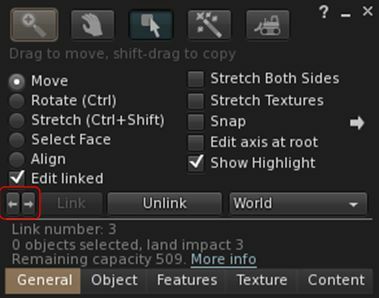 Simply locate one of the broken links in your inventory, right-click on it and select Replace Links from the context menu. This opens up a dialogue box, which indicates the total number of broken links matching the one you selected. Now drag-and-drop the item you wish to to associate with the links onto the Target area of the dialogue box and click START. All matching links should be repaired. An outfit count has been added to the outfits list. This releases has a significant number of navigation improvements, some of which are noted below. Firestorm adopts the Mouse Walk capability for easier avatar movement. To use this, click your avatar and hold both the left mouse button; this will turn your avatar as per usual as mouse is moved. 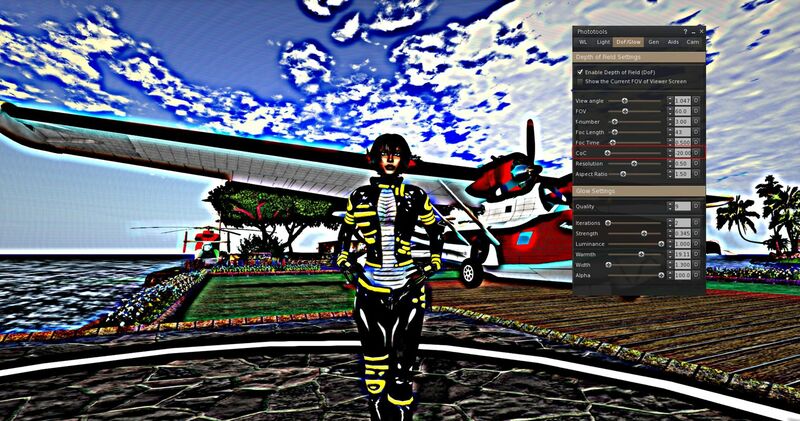 Now also press and hold the right mouse button – your avatar will move in the selected direction. Keep both buttons pressed and use the mouse to change direction as required. This will work with walking, running and flying. Also, you can now disable waiting for the pre-jump and landing avatar animations to play (Preferences > Move & View > Movement > Disable waiting for pre-jump and landing animations), which allows your avatar to look more nimble and light-footed. Within the radar floater, all columns other than “Name” and “Range” can now be shown or hidden (World > Radar > Radar Options > Displayed Columns). A new “Notes” column has been added, which allows you to see which avatars visible on radar have any profile notes you may have written for them. In addition, radar can now be configured to report avatars younger then a specified age, with an optional sound alert (Preferences > Chat > Radar > Age Alert or World > Radar > Radar Options > Report Avatar Age Alert). The region restart warning floater now includes a landmark selection drop-down and teleport button (the restart warnings are also now displayed in Nearby Chat). In addition, the Home button on the World map legend has been re-titled Go Home, to make it clearer this will teleport you home, not show your home location on the map. Additional navigation improvements are also listed in the release change log. The circle of Confusion (CoC) option (World > Photo & Video > Phototools > DOF/Glow > CoC or us the Phototools toolbar button), now allows negative values to be entered via the spinner or by manually entering a value (the slider will only drop to zero). A low negative value will yield a crisp, sharp image. High negative values can result in some psychedelic results. Setting a negative value in the CoC field (or via the spinner) in the Phototools DoF / Glow tab can lead to some interesting results! Whirly Fizzle also has examples of using negative numbers on the CoC on her Flickr stream. A new option has also been added to prevent the inventory floater opening when taking a snapshot that’s being saved to inventory (Preferences > Privacy > General > Automatically show snapshots in inventory after upload). Recalling where a specific option in either the menus or Preferences isn’t always easy. 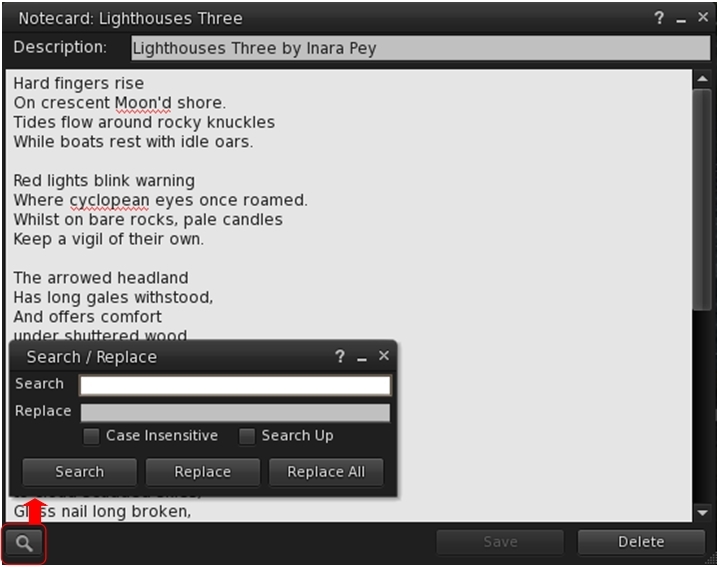 To try to improve things, Firestorm 4.6.9 makes both menus and Preferences searchable. For example, to find a specific option within the Firestorm menus, you can now use the Search Bar. Simply enter a search term, and Firestorm will then display the menus which contain one or more options using the term – you can then display each of the menus to see which one has the actual option you’re looking for. 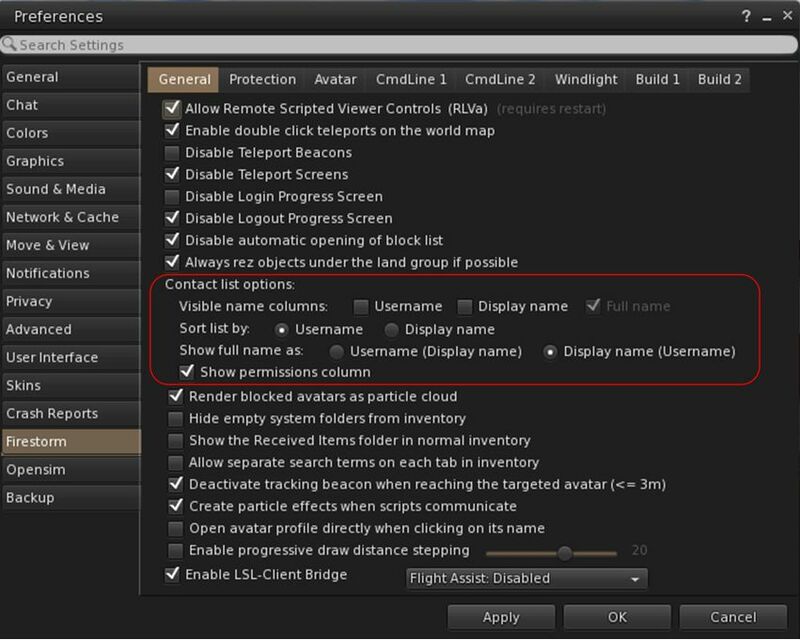 Searching Preferences works on the same principle – enter a search term or string in the new search bar at the top of the Preferences floater, and the floater will display those tabs (and the sub-tabs within them) with options and items which most closely match the search term. Mouselook right-click should no longer lock camera position on Mac. Fixed RLV Show Names Restrictions substituting in strings it doens’t need to. The texture console layout has been improved and overlapping text issues fixed. As noted at the top of this article, this is something of a skim through the 4.6.9 updates to gather some of those which are liable to have widespread interest among readers. The change log is available for those who want a more in-depth read, and as well as the above, there are translation and skinning improvements, stability fixes, GPU table updates, and even more fixes. I’ve been using various iterations of this release both in preview and beta, and have found it to be largely stable and reliable. I’m again disappointed that the SL Share 2 capabilities for Flickr and Twitter still haven’t made it to Firestorm, and I suspect that there well be a fair few disappointed that other features finding their way into other viewers are still awaiting their turn with Firestorm. But, that said, what is in this release is nevertheless impressive, and demonstrates a fair mix of features, improvements and bug fixes – and no small amount of addressing issues highlighted by users and adding features and options which have been specifically requested via JIRA reports, etc. All of which adds up to a fair degree of kudos for the Firestorm team. I too am impressed with this build, I have been on it since the weekend and have had no problems. There were so few problems with this build that the preview group chat was reduced to chit-chat and silence. Last weekend was bad for apparent Grid problems, situtations where it wasn’t just me and it wasn’t just in one place. I’m a little anxious about what will happen over Christmas, but at least Firestorm has had an update. It’s the way things fit together that sometimes seems problematic. Well, there’s always Kerbal Space Program, and there’s a rumour of a Bonnie and Clyde mod for GTAV. Tks for the review, Inara. I must be one of the few that don’t use firestorm at all but is always good to know it still exists. with over 200,000 downloads per release, I think it’s fair to say that there are a lot of people (an estimated 70% of SL’s user base) who are not only aware it still exists, but actively use it and are seeing their suggestions and ideas for UI updates, etc., enter it with each release! Like i said, i must be one of the few that don’t use it. I don’t deny the importance of firestorm, be for Sl or Open sim. I don’t deny the relevance of its contribute to all the tpv’s and even LL official viewers.